“I feel like Noddy and Big Ears,” wailed my passenger, hiding behind her handbag as we drove through the Friday night traffic in London’s trendy Clerkenwell. 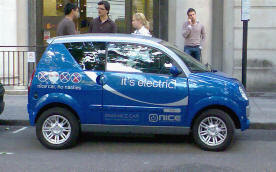 Evidently the Nice Car Company’s Mega City electric vehicle - our carriage for the evening - is not to everyone’s taste. It might look less cartoonish than its main rival, the G-Wiz electric runabout that has become a relatively common sight inside London’s C- zone, but it still exists on the geeky side of gawky. Tall, short, narrow, and adorned with small wheels and big panel gaps, the French-built Mega City will never be mistaken for a German executive sports hatch. We’ve borrowed the Mega City for the night to assess how practical this green mode of transport might be. It runs entirely on battery power, recharged from the mains. Buy your electricity from a renewable supplier and the Mega City offers CO2-free transport; the company will also offset the emissions released while making the thing by planting trees and hugging them for you. The Mega City boasts a welded aluminium frame – crash tested to conventional car standards - clad in ABS plastic. A dozen lead-acid batteries beneath the seats power what seems to be a washing machine motor under the stubby bonnet, surprisingly driving the front wheels rather than the rear. This highlights that the electric Mega City is not purpose built but based on an existing microcar aimed at European teenagers. Visit Paris or Rome and you’ll see thousands of the Mega City’s cramped cousins zipping about the boulevards on diesel or petrol power. According to the manufacturer our plastic chariot will travel about 50 miles on a single charge, at speeds of up to 40mph. A full charge takes eight hours. Most journeys will be undertaken with the accelerator buried in the carpet, and the dash-mounted speed selector switched to high - a low option helps to preserve power when stuck in traffic jams, apparently. Even in high-speed mode, the Mega City feels, well, slow. It gets away from a standstill smartly enough, but acceleration soon gives up and goes to bed. It takes a quarter of a minute to hit just 30mph, and the less-than-infinite stretches between traffic lights meant we never found out what flat-out might be. Like most other cars on the road the speedometer is about 10 percent optimistic - an indicated 35mph equated to about 32mph according to our satnav unit. Surprisingly, however, this turned out to be entirely adequate for Central London motoring. Inside the Mega City looks and feels less like a product of toy-town. The seats are comfortable and the dashboard is neat and modern in shape, made from a squishy plastic that feels more upmarket than it looks. The silver-painted centre console proved a little flimsy - unplugging the satnav almost unplugged the entire fascia panel - but it does at least contain easy-to-use ventilation controls and a conventional slot-in stereo. The non-adjustable steering wheel feels fine - although there's no airbag. The handbrake and gear selector live between the front seats. 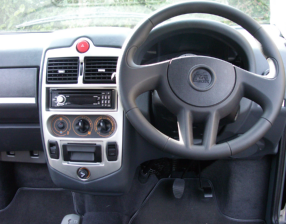 Push the gear lever down and forward to engage drive, pull back into neutral and – surprisingly without the need to push down again - you can slot straight back into reverse. Yanking the lever back in a misguided attempt to engage a non-existent second gear is therefore probably not a good idea at speed. Or indeed when going forwards in the Mega City. When engaged at rest, reversing sensors squawk to confirm that you’re about to head backwards. You may have read that electric cars are quiet, but the Mega City isn’t - its motor makes only a subdued milkfloat whine, but the rest of the car makes enough clamour to raise noise levels to the norm for a small car. Over the rubbish road surfaces typical in cities, the car has all the refinement of a badly loaded spin dryer. Actually it is quiet – from the outside. More than the usual number of Friday night revellers seemed content to stroll out in front of the Mega City, forcing us to toot its feeble, Noddy-and-Big-Ears horn. Using the brakes, meanwhile, is a bit like going to the gym. They are completely without the servo assistance most drivers take for granted, demanding a prodigious prod before doing anything about slowing forward progress. Once braced against the seat back, however, it proved perfectly possible to bring the little beggar to a prompt halt. Steering is likewise down to unaided human muscle and sinew. In common with other non-assisted hatchbacks, the wheel seems to have about 40 turns lock to lock. The turning circle isn’t bad per se - but getting to full lock when parking requires a committed bit of bicep. Fortunately the Mega City is very short and so will fit in normal-size gaps without too much to and fro. Overall we liked the Mega City a lot; it's fun to drive in a way that almost all modern hatchbacks are not. But we can’t help feeling that the car deserves a beefier powerpack. Lithium-ion power is too costly at present - particularly for a car that already looks very pricey compared to conventional petrol alternatives – but better batteries might mean greater range and, arguably more important for a city car, better acceleration. Electric power assistance for the brakes wouldn’t be a bad idea either, if the Mega City is to capitalise on the failings of its rivals and persuade prospective buyers that there is a safe route to fully electric motoring.